What is a hernia? What are inguinal and femoral hernias? A hernia is a protrusion of an organ or body part through the wall of a cavity in which it is normally enclosed. Inguinal and femoral hernias, are groin hernias, in which a part of the abdominal contents, either bowel or fatty tissue, protrudes through the abdominal wall at the inguinal or femoral canal and comes out just below the skin. These hernias are very common, occurring in up to 10% of males, but are much less common in females. 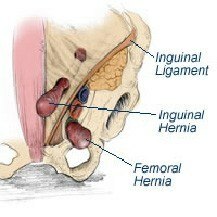 Femoral hernias are more common in women than men, but are much less common than inguinal hernias. What causes a femoral and inguinal hernia? Hernias that occur in childhood or adolescence are probably congenital. In adults, a hernia is usually acquired. Although not well proven, it is thought that occupations involving heavy lifting or manual work increase the chance of developing a hernia. Cigarette smoking, chronic constipation, obesity, prostate disease and chronic coughing are also thought to predispose to hernia formation. In many patients, none of these factors are present and the development of a hernia is thought to be related to the fact that the inguinal and femoral canals are natural areas of weakness in the body wall. What are the signs and symptoms of a femoral and inguinal hernia? The most common sign of a hernia is the presence of a lump in the groin. Sometimes hernias can be painful, but small hernias may be unexpectedly detected at a routine examination. The most serious complication of a groin hernia is strangulation, which occurs when a segment of the bowel gets caught in the hernia and becomes obstructed or even gangrenous. How is a femoral and inguinal hernia diagnosed? A hernia is commonly diagnosed by a simple physical examination by your doctor. In some cases, ultrasound examination of the groin is ordered, but most surgeons are sceptical of the accuracy of ultrasound examination for hernia. The results of ultrasound examination must be interpreted in conjunction with a physical examination. What are the consequences of not treating femoral and inguinal hernia? Left untreated the herniated section of the intestine can get trapped and strangulated. With no blood supply, the tissue can get infected and die. This is a life-threatening situation and requires immediate attention. It can also put pressure on the neighbouring tissues, causing pain and swelling in the surrounding regions. What are the options for femoral and inguinal hernia treatment? Small inguinal hernias that do not cause any symptoms are usually not treated; your doctor may follow a wait-and-watch approach. Surgery is recommended for hernias that show symptoms, are enlarged and entrapped. Hernias in children are generally operated on as they have a high risk of becoming strangulated.